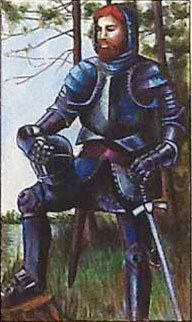 Rogan The Red as pictured in Installment #13. Accepted into the Companionship as a Guide to the north is Rogan the Red. * His stately mannerisms are annoying to the rest of the party but amuse Jasmine. When asked about his past, he becomes evasive. He is an excellent horseman, as stealthy as a thief, and is quick and accurate with a knife. Although his interest in Jasmine is more than just passing, he keeps a calculated distance. As Thorne’s friend, Rogan advises her to join Jasmine and Glynn on their journey northward. He conceals his fascination for the blonde magician. Thorne, handy with a sword, offers protection. *Other names considered for this character were Kayne, Macklin, Red Burkhard and Rowan. This entry was posted in Jasmine & Role Playing Games, The Creative Process and tagged horseman, Jasmine, Rogan, The Story of Jasmine, Thorne on February 10, 2018 by Darlene.